On Thursday September 19th we were coming home from dinner in the Miata with the top down. I noticed this thing lighting the sky up. I had to hurry home to get my camera. It started out as a straight line but then changed to wiggly as the photos here show. It was really quite a pretty sight but early because we didn't know what it was. By the time I got my camera much of the brightness had faded into what you see here. 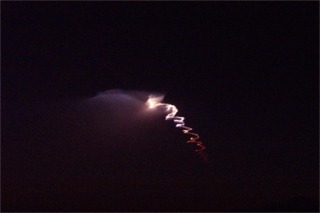 It turns out this was a Minuteman III test missile launch from Vandenberg Air Force Base which is about 170 miles away. 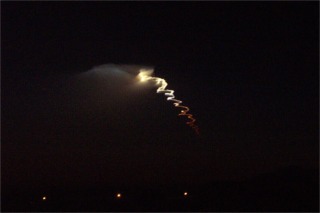 Because the missile's contrail was still in the sunlight it looked the way it does here. For other (and better) photos click here.